Living adjacent to open space in San Diego is common inland as well as in coastal communities, which means that homeowners are exposed to fire risk if brush in these spaces isn’t maintained. And, homeowners are responsible for reducing fire risk on their properties by removing potential fuel sources like dead vegetative growth and weeds to slow a fire down and give firefighters enough time to hopefully save the structure. Basically, there are two things homeowners need to do for a fire-resistant landscape: maintain the landscaping surrounding their homes and use plants that are slow to ignite. Do you have firewood piled up outside, junk areas or especially flammable trees like eucalyptus or pines? Your house needs a certain amount of clearance from these things ranging from about 30-50 feet, however, in the case of a eucalyptus tree in a fire zone, experts recommend at least 250 feet. Think about which direction the wind blows and create a larger buffer in areas where it’s stronger–think about how an ignited spark might fly in a gust. Does your house have a wood shake roof? 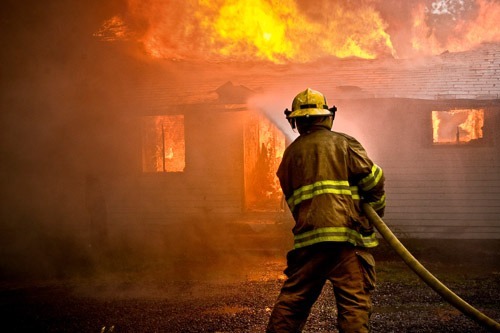 Regardless of whether you live on the coast or inland, replace it as experts suggest that embers from a fire a mile away can ignite a wood shake roof. Are your roof gutters full of junk? Is your wicker furniture old and flammable? These are only a handful of things to consider, especially if you’re in a rural part of the county. Survey for cracks in wooden structures where embers can lodge themselves if they’re blowing in the wind. If you aren’t paying attention to flammable items surrounding your home, a fire-resistant landscape isn’t going to help much. Because of California’s drought and the risk of wildfires, the County of San Diego and City of San Diego both have extensive resources online homeowners can use to research brush management and fire safety around their homes. If a neighbor suspects that the landscaping surrounding your home isn’t fire safe enough, they can complain to the local fire management agency and if you don’t comply, the fire agency can escalate the request to the County for additional enforcement. The City of San Diego Fire Safety and Brush Management Guide instructions extend 100 feet from your home and are extremely detailed, but here are examples of what is required. This extends 35 feet from your home and should be full of low-growing plant material (less than 4′) and pruned trees. New construction of fences, gazebos and other structures must be made of fire-resistant materials or have a 1-hour fire resistance rating. Proper irrigation must be installed to keep the plant matter thriving. This zone extends 65 feet past zone 1 and is where permanent irrigation is discouraged in order to prevent weed growth. This zone also must be pruned seasonally to reduce flammable brush which includes pruning 50% of plants over 2′ tall down to 6″ tall while keeping roots in tact to prevent erosion. When pruning use a staggered pattern to create a more natural look (they have examples online) and slow a fire spreading from bush to bush. Trees and shrubs need to be pruned into an umbrella shape in order to thin out flammable debris at the bottom while keeping enough shade to prevent weed growth. When finished, make sure to haul away all debris to a landfill versus leaving it piled up in your side yard—creating another fire hazard. Fortunately, there are professionals throughout the county that can assist with brush management or contact your local nursery. When selecting plants with fire risk in mind, look for those that have high water content in the leaves. Many homeowners believe that installing an irrigation system that can blast an approaching fire is enough, but experience has shown that irrigation water (it’s just not strong enough) will vaporize from the heat of the fire long before it hits the flame. 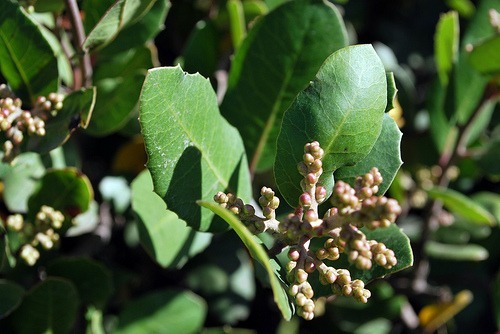 Some (not all) native plants actually burn more slowly that conventional plants including lemonade berry (shown above) which keeps water in its leaves even during dry summers. Las Pilitas nursery has an alphabetical list of native plants and their leave burn times so look for those with the longest resistance, especially if you live in a rural area. They also compare the native plant ignition time to common household items like cardboard and other things you may have lying around the yard. 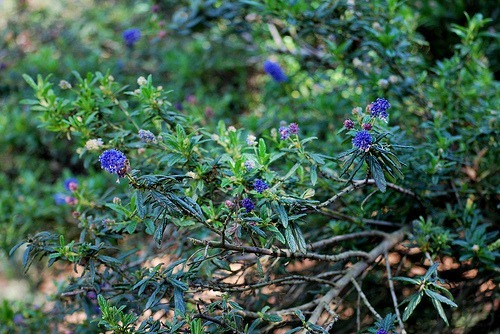 We’ve discussed ceanothus several times lately, which also happens to make an excellent and gorgeous heat shield around the home with its water-wise lifestyle and pretty blue flowers in the spring. You see, planting a fire-safe landscape doesn’t have to be boring! Though it may not be aesthetically pleasing, a true way to minimize fire risk around the home is to minimize plant material and increase hardscape as rocks and concrete don’t typically burn. Plants are necessary in most cases (so do not think that omitting them completely is a good idea) as roots help stabilize soil. When you do plant, make sure that the plants aren’t touching each other, in order to prevent flames from spreading quickly. Use mulch in between to prevent weed growth, but keep it a few feet away from your home. Experts believe that the benefits of mulch retaining moisture in the ground and keeping weeds away exceeds the risk of it smoldering. Ice plant covers hillsides all over Southern California because it’s said to be an excellent choice in areas with fire risk as the green leaves are full of water and don’t burn easily. Because the leaves are full of water, they become heavy, especially in the winter when rain water is plentiful. What can happen in instances of heavy rain is that the ice plant can become so heavy on top of saturated ground, that gravity forces it downward causing landslides. It happens all the time in La Jolla. 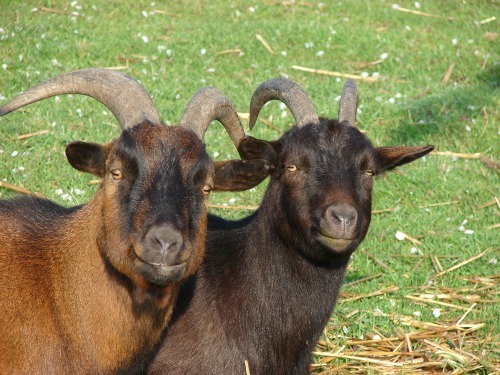 You’ll need to apply for a permit through the city (and, there are strict requirements to ensure the safety of the goats and habitat they’ll graze on), but goats have been instrumental in assisting with brush management of larger fields. This new technique is being applied all over California, but works like this—goats graze within the boundaries of a portable electric fence that surrounds an area of a few acres at a time. The fence is moved every few days and, in some cases, herding dogs surround the enclosure to protect the goats from predators. The bottom line is that good landscape hygiene, though laborious and potentially costly, is the best way to prevent losing your home in a fire. How do you make your home fire-safe in San Diego?